Guest performances have been taking Anda-Louise Bogza to the major renowned opera houses in Europe and overseas. 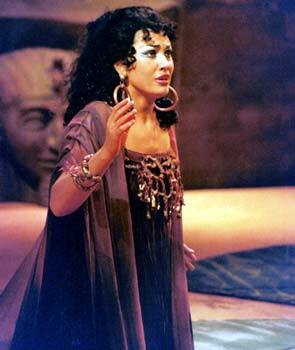 It is above all her magnificent portrayal of AIDA at the Vienna State Opera, the Berlin State Opera, the German Oper Berlin and the Opera Leipzig that brought her great triumphs. 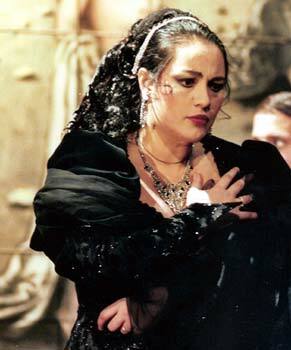 And her powerful portrayal of TOSCA brought her to Maggio Musicale Fiorentino in Italy, the Bavarian State Opera Munich ( Zubin Mehta conducting ), the Frankfort Opera, the Semper Opera in Dresden, the Opéra National de Bordeaux, the New Israeli Opera Tel Aviv, the Grand Théâtre de Luxembourg, the National Operas of Bratislava , Prague, Bucharest and to Japan. She was Katja Kabanova at the Tokyo Suntory Hall DONNA ANNA at the Opéra de Marseille. 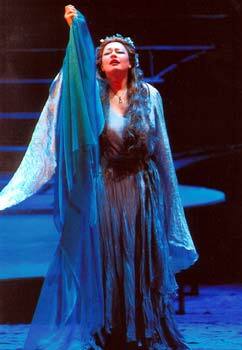 She sang the FOREIGN PRINCESS in Rusalka at the Opéra National de Paris Bastille ,at the Théâtre Royal de la Monnaie in Brussels and the Semper Opera in Drsden. At the Opera di Roma she portrayed with great success the title role in RUSALKA. 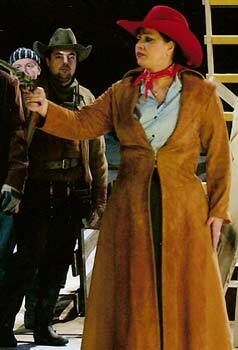 The Rumanian-born artist’s most frequently sung roles include parts like LEONORA („Il Trovatore“), which she sang at the Hamburg State Opera, the Budapest State Opera, the Royal Opera Copenhagen, at the Teatro de la Maestranza Sevilla ( Maurizio Arena conducting) and in the USA. The label Arte Nova Classics released a portrait of the artist with Italian arias and a complete version of „Il Trovatore“on which she sang the Leonora and the recording of „Der Sarlatan“ from Pavel Haas, on which she performed the Rosina was released by the label Decca. Anda-Louise Bogza studied at the George Enescu Conservatory and at the Academy of Music in Bucharest and Prague (piano, singing and harpsichord). First engagements brought the young soprano to the Prague State Opera and National Theatre Prague, two houses where she still can be seen in roles such as Jenufa, Katia („Katia Kabanová“, Sina (Hans Krasa „Verlobung im Traum“), Donna Anna („Don Giovanni“), Leonora, („Il Trovatore“), Aida, Tosca, Giorgetta („Il Tabarro“), Amelia („Un ballo in maschera“), Elisabetta („Don Carlo“), Lisa („Pique Dame“), Minnie („La Fanciulla del West“), Manon („Manon Lescaut“) and Abigaille („Nabucco“).In 1994 she won the Audience prize at the Vienna International Singing Competition. Among the soprano’s concert engagements, the following are particularly worth mentioning: her performances at the Vienna Music Hall (Schubert, Haydn – Jahreszeiten, Verdi - Requiem), at the Royal Albert Hall London (Dvořák), the Brucknerhaus Linz (Janáček – Glagolitic Mass), the Jahrhunderthalle Frankfurt , the Aalto Theatre in Essen, the Amphitheatre Madrid (Beethoven - IX. Symphony), the Châtelet Paris, the Opera House Nizza, at the National Concert Hall Dublin, in Prague, Istanbul, Tokyo, Taipei,...with renowned orchestras such as the Czech Philharmonic Orchestra, the BBC Orchestra London, the Stuttgart Philharmonic Orchestra or the Gewandhausorchester Leipzig. As a result of the discussion regarding the 'Right of Quotation of Reviews on the Internet' and the penalties subsequently imposed, we felt compelled to remove all press cuttings from our internet site. Upon request we will gladly send you reviews on our artists.